I can't believe I am finally knitting on this project. It was conceived four years ago and I've spent those years collecting rare breed fleece and roving samples, spinning, and thinking. 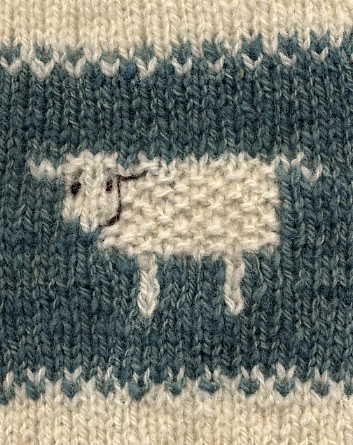 I developed the sheep motif fairly early; after I got the fleece for the body of the sweater, a kilo of Ryeland. Now, with over a dozen rare breed yarns it felt like time to start knitting. 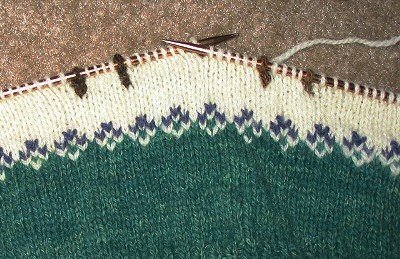 I worked up a tension swatch and am using the measurements from a favorite sweater as a guideline. My gauge is 20.5 stitches and 32 rows per 4 inches. As you can see the sheep will be intarsia knit. It's been a lot of fun arranging and rearranging the different colors of yarns, trying to decide what to put where. As you can see, so far I've abandoned all my sample swatches. I have to admit that I'm still contemplating exactly how I'm going to do the sheep on the fronts. 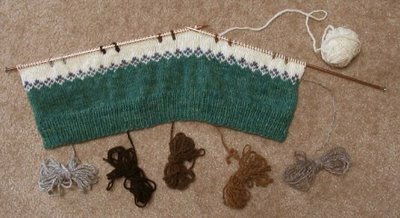 In some ways it would be so much easier to make this a pullover as five sheep are fitting nicely across the back width. That means each cardigan front will have enough room for 2 and 1/2 sheep(!). One idea I have for the rows of sheep on the fronts is to to knit a ewe and two smaller lambs (instead of 2 and 1/2 sheep ;). I think this would be a nice way to show off the variety of fleece colors for some breeds like Navaho Churro, Shetland, and North Ronaldsay. Also I still have to make decisions about the front and neck bands, and buttons; things which are fun to contemplate as I sit there knitting. If only all my decisions could be this enjoyable! Looking great so far! I like the green/blue/white transition band. Well even though you're not 100% sure how it will all end up, at least you have a really great looking start! This is process knitting at its finest! I think it's gonna be awesome. I think staggering them a little helps avoid the Totally 80s thing. Lovely...thanks for thinking in print while you work out the details of the sweater. That's my favorite part...the problem solving along the way.